Yesterday, we visited the Book of Kells exhibition at Trinity College, Dublin. 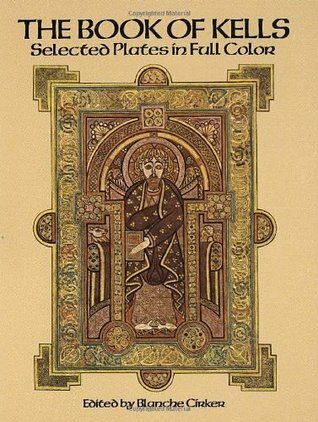 The book was indeed impressive and beautiful, but I liked even more the poem Pangur Bán, originally written in 9th century Irish by an unknown monk, on a copy of St Paul's Epistles. Robin Flower's translation:I and Pangur Bán, my cat 'Tis a like task we are at; Hunting mice is his delight Hunting words I sit all night.Better far than praise of men 'Tis to sit with book and pen; Pangur bears me no ill will, He too plies his simple skill. 'Tis a merry thing to see At our tasks how glad are we, When at home we sit and find Entertainment to our mind.Oftentimes a mouse will stray In the hero Pangur's way: Oftentimes my keen thought set Takes a meaning in its net. 'Gainst the wall he sets his eye Full and fierce and sharp and sly; 'Gainst the wall of knowledge I All my little wisdom try.When a mouse darts from its den, O how glad is Pangur then! O what gladness do I prove When I solve the doubts I love!So in peace our tasks we ply, Pangur Bán, my cat, and I; In our arts we find our bliss, I have mine and he has his.Practice every day has made Pangur perfect in his trade; I get wisdom day and night Turning darkness into light. Saw this at my local used book store and immediately picked it up to buy. I've heard a lot about the Book of Kells but actually don't really know anything. Seeing photos of the book, now I can understand what the fuss is all about. From 800 A.D. It's BEAUTIFUL! The reproductions could be better, but I don't know of a better way to otherwise study this magnificent book. Anonymous Blanche Cirker - Books can be attributed to "Anonymous" for several reasons: * They are officially published under that name * They are traditional stories not attributed to a specific author * They are religious texts not generally attributed to a specific author Books whose authorship is merely uncertain should be attributed to Unknown.